Just a hop (and not even a skip and a jump) away from Pearl Restaurant buzzes Pearl Café. Like its sister up the road, at Pearl Café it’s all about attention to detail. From entry to exit, you are thrust works of art in both edible and material form. As you step through the glass door, an Elizabethan woman with a rose for a head greets you from her poster, before the attentive staff can seat you. Although the café does not boast a large capacity, the staff move efficiently and courteously to enable everyone to grab a table with the minimum amount of waiting possible. Influenced by RGMadden Design Store next door, Pearl adds a touch of class to each table with Alessi Japanese salt and pepper grinder couples and sleek, stainless steel water jugs. It’s no secret that this place is a pearl-in-the-rough of Richmond. Expect to wait a short while for a table. It’s worth it. You can choose to sit at the pristine, white communal table in the centre of the light-filled room, or alternatively at one of the tables at its perimeter. On a sunny day the two tables out the front are a great spot to sip coffee and watch Church Street roll by. The communal table guides the hungry eye to the rear of the café where the glass cabinet awaits jam-packed with treats on the left, and sandwiches and wraps on the right. The space feels airy, even when packed with people, and has an industrial warehouse edge to it. Three spiky lights hang from the ceiling, emitting an aesthetically pleasing glow rather than contributing to the sunlight flooding through the glass windows. On the far right wall, a gigantic light box boasts the menu. This is repeated on the colourful, folded paper menus. Breakfast is from 7am - 11am on weekdays and 8am - noon on weekends. While the general public seem to have mixed reviews amongst online forums on Pearl’s breakfast staples, such as the eggs with a plethora of extras, it is the dishes with a twist that are to die for. The muesli comes in a mosaic of rhubarb, apple compote and organic yoghurt while the home-baked muffins tempt the faint hearted from the top of the cabinet. For a more sugary start to the day you can sample a French toasted dark chocolate sandwich with maple syrup, double cream and ice cream… although your arteries may never forgive you! I chose the Goan avocado salad with buffalo mozzarella, served on cape seed toast, accompanied by a mini Virgin Mary (I wasn’t game for the standard Bloody Mary!). The serve was generous and closely resembled a giant, gourmet bruschetta with the addition of red onion and capsicum. Also sampled was the ‘Breakfast Pizza’ that tasted even better than it looked, topped with egg, thinly sliced bacon, the tang of spring onions and Parmesan cheese. But if you’re one of those people where breakfast isn’t breakfast unless it includes eggs, there are endless gastronomic options. From wild field mushrooms cooked in sage and burnt butter, served with double smoked ham on multigrain, to thick cut ham-off-the-bone with Brie and Dijon mustard, melted on baguette. It’s a great opportunity to try something different. My companions told me the coffee was “very good” rating it a “4 out of 5.” But on this particular day I just couldn’t resist the traditional Italian hot chocolate, which came beautifully prepared in a globular glass with warm frothy milk and a dish of rich chocolate for melting. 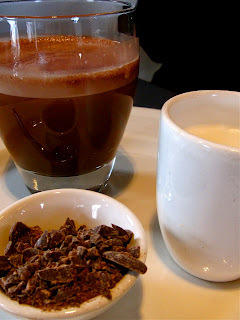 More of a ‘warm’ chocolate than a hot chocolate, it was delicious nonetheless. Lunch at Pearl has a modern Asian twist with the options of green chicken curry with Thai eggplant and Siamese watercress, served with coconut rice. For vegetarians, there is the coconut pumpkin curry with shallots, mint and tamarind dressing, served with jasmine rice. You can also order a curry laksa or a ‘short and long’ soup with noodles and wontons, as well as Thai rare beef salad or Vietnamese shredded chicken and vege salad. If Asian cuisine isn’t to your taste, you also have the choice of red lentil and tomato soup, smoked salmon and artichoke salad with radish and blood orange, beef bourguignon pot pie, chicken and leek pie, and a huge selection of toasties, sandwiches and gourmet baguettes. Regardless of your choice, Pearl Café is licensed with a small but selective list of beers and wines by the glass. Whether you visit for breakfast or lunch, it is essential to finish with something sweet. The counter boasts swanky hedgehogs, brownies, lemon slices, lamingtons, Portuguese custard tarts and more! I can highly recommend the carrot cupcakes and the Valrhona chocolate crackles (the largest I have ever seen which easily satisfied two people!). If you have room for a more substantial dessert you can choose a classic sticky date pudding with honeycomb, layered pear trifle or a molten chocolate pudding with double cream. Pearl Café is just as chic as its sister restaurant up the road but without the price tag and the fuss. Unpretentious, but classy, there is little surprise that it received two Chefs Hats from the Age Good Food Guide this year, as well as two stars from the Australian Gourmet Traveler Restaurant Guide.